Looking around, I see countless things created by people. Everyday items, clothing, furnishings, vehicles, buildings, highways, technology and so much more… all human made. Starting with an idea or inspiration, people collaborate to develop the materials, tools and processes to translate ideas into physical objects. As a society, we invest much in our human creations. Likewise on a personal level, I’ve worked hard and invested time, money and energy on the things that enliven my life, experiencing the creative process and learning along the way. For example, I’ve filled many a dream journal, capturing decades of dreamtime stories along with the wake-time reflections from my individual study and within dream groups. After I finish a creative project, I enjoy the fruits of my labor for some period of time. At some point, though, my focus drifts and shifts to something new. And after a while, I wonder what to do with all of the things I’ve accumulated, especially those things I no longer need? Many items, like photos, school mementos and art I created back when, I’ve stored away. I rarely look at them but when I do, they help me remember special parts of my life journey. I suppose that is why I’ve found them valuable enough to keep. With other accumulated things that don’t rise to that level of meaning, I feel that my closets and living space are too crowded. And, no, I don’t want to find a bigger space to grow into. When I feel too crowded, I sometimes teeter back-and-forth thinking of how much I’ve invested in those things versus my desire to simplify. Do I have the time and energy now to sort through them? How do I prioritize my time? Do I procrastinate or fall into the mode of when something is out-of-sight, it is also out-of-mind. In my art studio, when it’s too crowded, I have a hard time starting something new. Growing up, my mom taught my siblings and me to clean out our dresser drawers, closets and desks several times a year. We often did these house-cleaning rituals over school breaks when seasons changed and as we outgrew our cloths. We didn’t have the luxury of a big house, so we learned to let go of outdated and outgrown things. It usually felt great after the clean-out, as we were also creating space for new things. I also worked professionally for many years in the recycling field. I thought a lot about ways to reduce, reuse and recycle the materials of daily life. Whenever a new technology became popular, recyclers received the outdated discards to be reused or re-created into something else. Or if there wasn’t a market for the items, they were disposed of. And how do I manage my personal things? Am I a pack-rack, sentimental, procrastinating or too busy to sort through things I no longer need (or all of the above)? I’ve invested much of my energy creating, but it also takes energy to hold onto things. In a desire to simplify, I know I need to let go of things. I’ve found joy in giving items to friends and family. I’m thankful to live in a neighborhood with a very active list serve; people daily post items to give away or ask to borrow infrequently used things. I’m also thankful for the many charities that make it super easy to schedule donation pick-ups. In my art studio, it’s time to go through my stash of dream journals. I’m revisiting especially vivid dreams. Other more ordinary dreams, I turn the page over. My dreams represent a chunk of my life and a bit of my creative energy… first the dream, then the writing of it, then thoughts and discussion. I especially enjoy creating art inspired by my more vivid dreams. Having studied my dreams for almost 20 years, I’ve accumulated a large shelf full of dream journals. In them, I’ve written many dreams and wake-time reflection from on my own or from others in a dream group. 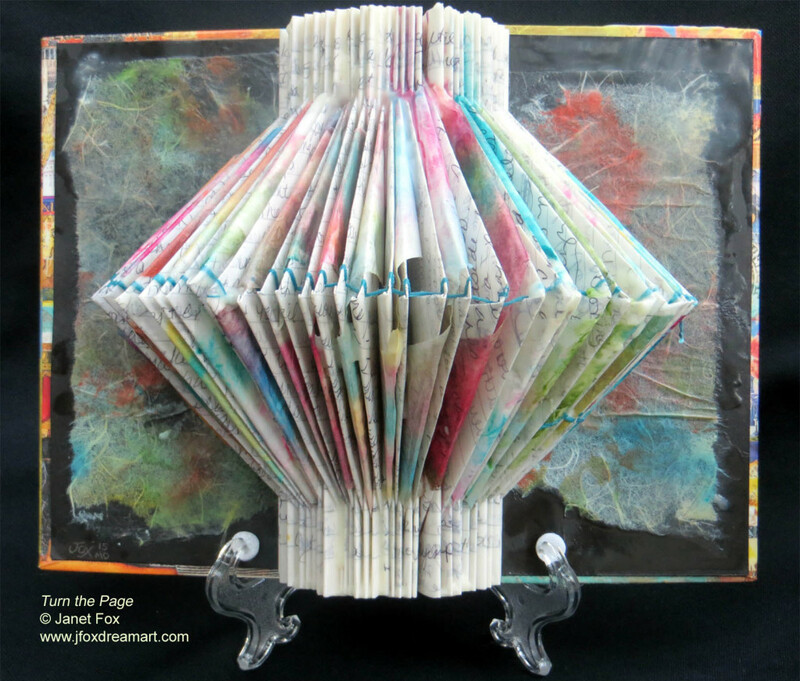 This 3-dimensional art, Turn the Page, was once a dream journal covering 99 days of my life from back when. I re-read the pages and saved the ones I wanted to work on again. After, I folded in the remaining pages, inserted colorful papers with encaustic, and sewed the folded edges together using my favorite color of embroidery floss. This piece is the first in a series of dream journals I’m letting go of. Somehow, this feels really good to re-create. How do you part with personal things you no longer need?